Fairfield Borough Hall is located at 108 West Main Street, Fairfield PA 17320; phone: 717-642-5640. Photo: Fairfield Inn, Main Street, Fairfiled, PA. Listed on the National Register of Historic Places in 1973. Photographed by User: Acroterion (own work), 2011, [cc-by-3.0 (creativecommons.org/licenses/by/3.0)], via Wikimedia Commons, accessed March, 2017. Initial European settlement in the area is closely associated with the establishment of early land grants or manors. 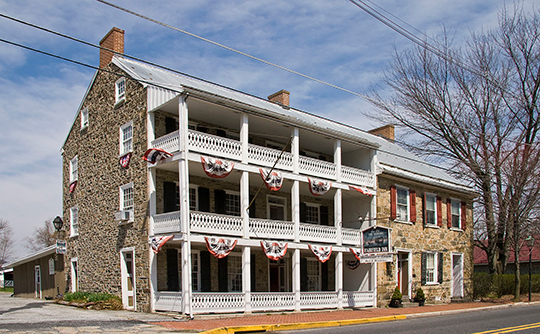 In 1732, two land grants known as Carroll's Delight and Carrollsburg Manor were surveyed in what was believed to be a portion of the northern Frederick County, Maryland colony. Carroll's Delight was located in what is now eastern Hamiltonban Township and Fairfield Borough, while Carrollsburg Manor was located in what is now eastern Liberty Township. Both of these land grants were granted to Charles, Daniel, and Mary Carroll in 1735, and settlement began shortly thereafter with Charles Carroll managing Carroll's Delight and Daniel Carroll managing Carrollsburg Manor. Adams County Pennsylvania, Joint Comprehensive Plan, 2014, www.adamscounty.us, accessed June, 2017.